This bench is a hot seller. We sell a lot of these so I'm assuming customers lover them. Many of them buy different sizes again so that tells you what others think of the product.Thanks. The Mobile Workstation combines the strength of hardwood and heavy-duty steel with the total mobility of four 360 swivel casters. Designed for easy maneuverability on uneven surfaces, each caster also locks fully in place to hold the workstation steady for projects requiring precision. It's even stylish enough to roll up next to the grill for backyard get-togethers. While other manufacturers make claims about weight capacity, strength or durability, Gladiator brand proves it with some of the industry's most rigorous testing regiments to ensure unsurpassed performance in any environment. Dimensions 24.0 In. X 36.0 In. X 34.0 In. Very sturdy and well-built workstation. The locking castor wheels alone would cost at least $. 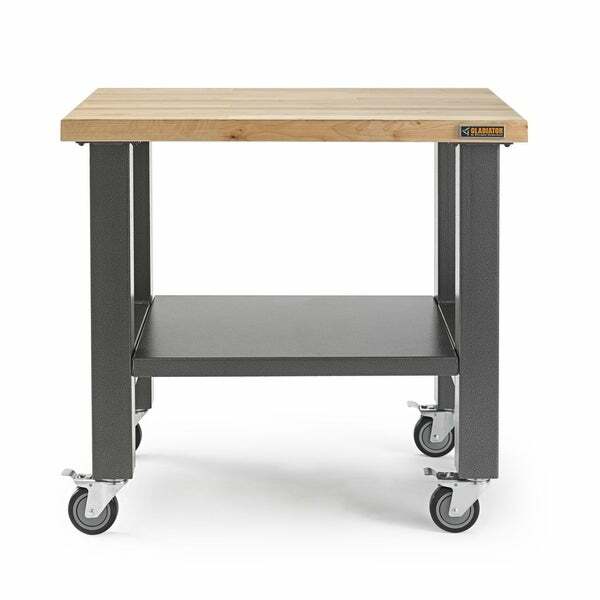 I was thinking about building my own mobile table and was about to order castors and saw this on sale (plus had gift cards). Glad I did purchased this. I might just have to buy another one!